Trout skin is thin enough to be edible, and crisps up on the grill. While you may spot a few skinless trout offerings at the fishmonger, more commonly you'll find trout fillets with the skin on one side, topped with flaky, oily flesh. Don't bother removing the skin. Not only is trout skin thin enough to be edible, but it cooks up to a satisfying crispness on the grill. Lemon juice -- a natural partner for fish -- helps preserve the skin's natural color while neutralizing any potential "fishiness." Along with these attributes, lemon juice adds flavor to trout without piling on fat and calories. Oil your grill rack. Set up the grill for medium-high heat. Cut a lemon into wedges. Squeeze the juice from all of the wedges into a small bowl. Add a splash of olive oil or melted butter to the lemon juice. If desired, sprinkle in spices and chopped herbs. Whisk this basting liquid until the ingredients are well-incorporated. Place the trout fillets on a clean platter. Brush the non-skin portion of the trout with the lemon juice-basting mixture. Sprinkle salt and pepper over the lemony basting liquid. Put the fish, skin-side up, on the grill. Leave plenty of space between all the fish fillets. Flip the fish after 3 to 5 minutes. Grill the trout skin-side down for an additional 3 to 5 minutes, or until the flesh flakes easily. 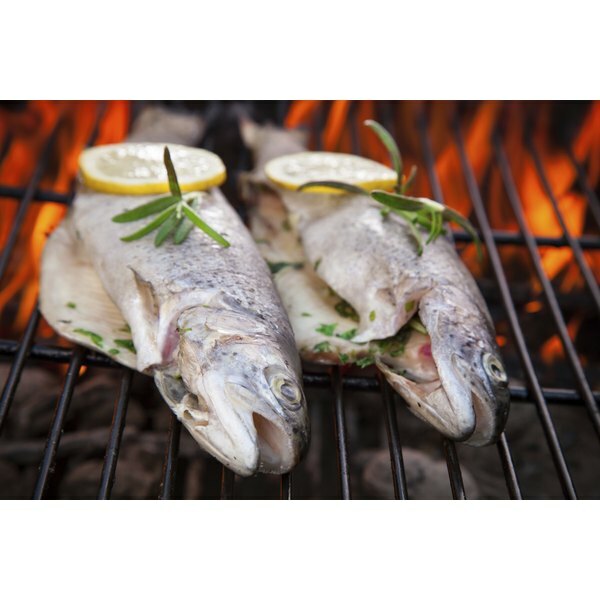 Remove the trout fillets from the grill. Serve the trout on individual plates or on a large platter. Remember to bring your seasonings and basting liquid to the grill when you carry the trout over. While you can prep the flesh side of the fillets in the kitchen, you'll need these ingredients on hand once the trout is flipped. If you really like fish skin, consider grilling a whole trout. Use whole trout that's already cleaned and gutted. Tuck lemons and other aromatics inside the fish for extra flavor and brush oil or mayonnaise on the skin for extra crispiness. Depending on the size, the fish cook in about 12 minutes total grilling time. 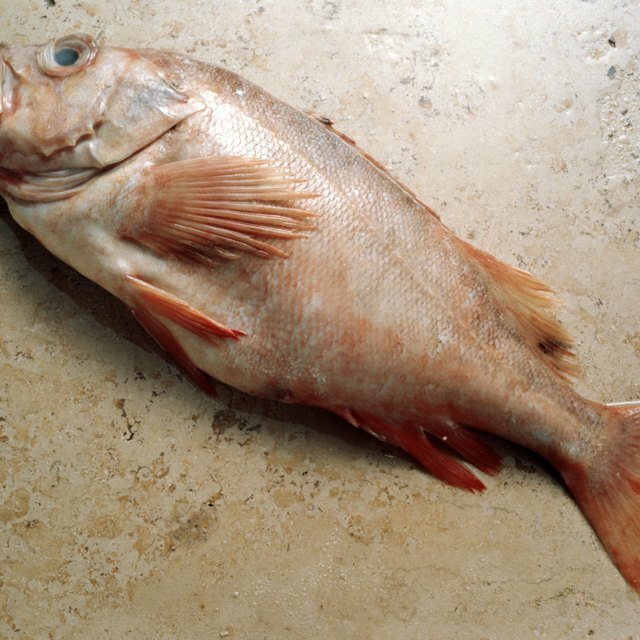 The U.S. Department of Agriculture considers 145 degrees Fahrenheit the safe minimum internal temperature for cooked fish. If you have a cooking thermometer, use it to confirm this temperature while the fish is still on the grill. If you don't own one, look for opaque flesh that you can easily flake, which indicates thorough cooking.